The lateral leaflets of Desmodium motorium exhibit rhythmic upward and downward movements with a period in the minute range. Apoplasmic K+ and H+ activities were monitored in situ in the abaxial part of the pulvini with ion-selective microelectrodes. An extracellular electric potential was recorded simultaneously. The apoplasmic H+ activity of all pulvini exhibiting a regular rhythm of the extracellular electric potential oscillated with the same period between about 10 and 20 mM. The apoplasmic K+ activity was high when the membrane potential of the motor cells was depolarized (about 36 mV) and the cells were shrunken. In contrast, the apoplasmic K+ activity was low in the swollen state of the motor cells, when the membrane potential was hyperpolarized (about -136 mV). The volatile anesthetic enflurane suppressed reversibly the movement of the leaflets. The same treatment also arrested spontaneous oscillations in the apoplasmic K+ activity in the pulvinus. The apoplasmic K+ activity oscillated roughly in phase with the K+ activity between pH 6.6 and 6.0. Application of white light disturbed the rhythm and increased the extracellular pH. 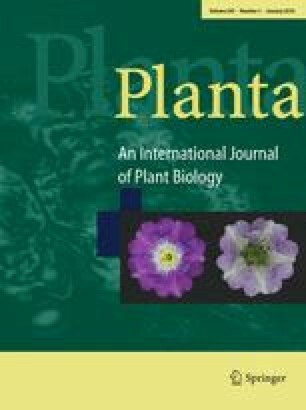 Our results indicate that the physiological mechanism that drives the lateral leaflet movements of Desmodium motorium is closely related to the osmotic motors mediating the leaf movements of Mimosa, Samanea and Phaseolus. B. Antkowiak was supported by the Stiftung Volkswagenwerk.